Easy Ways to Play with your Kids, Even When You Don’t Want To. Do you ever have those days when all your kids want is to do something fun with you? All they want is for you to play with them, but you really don’t feel like it. I remember days like those so well. Days when I wasn’t feeling well, or when I hadn’t had any sleep, but my kids still needed me, and I still needed to engage them in something so they didn’t fight constantly. Days when I was so busy, or stretched so thin that just the thought of taking time out to play tea parties made me feel overwhelmed and exhausted, but the guilt of not interacting with my kids threatened to swallow me. Days when I just needed to get dinner made without the kids tearing the house apart or trying to climb up my leg while I drained the pasta. Days when the thought of dressing up another Barbie made me want to stab my eyes out with a fork. 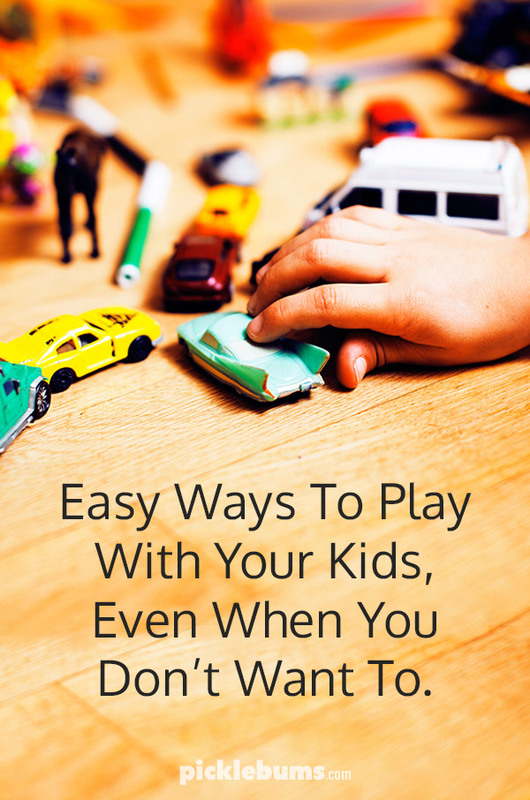 Over the years I came up with a list of easy ways to play with your kids, even when you don’t feel like it, or don’t have the time, or just don’t want to! A list that totally saved my sanity, and might just save yours! Easy Ways To Play With Your Kids Even When You Don’t Want To. These activities and ideas are easy to set up, use basic items, and don’t make much mess. They are ‘open-ended’ which means there is no one ‘correct’ way to play with them, so they work for a variety of age groups, and the kids can use them again and again. Some activities require more adult interaction than others. Some need you to be nearby to supervise, but you can do that laying down resting or while you do something else. How much supervision is needed will depend on the age of your children and on individual kids personalities, but most of these activities are aimed at 2+ year olds. Floor Drawing – Roll out a length of paper (the Ikea rolls of paper are perfect for this!) on the floor and dump out the crayons. With the paper on the floor everyone can reach, no one argues over chairs, or crawls onto the table trying to get the green crayon, and I can lay on the couch, or fold the washing near by with only a quick reminder for the toddler not to draw on the floor. Drawing Prompts – Print off some of our printable drawing prompts, and grab the pencils or markers. These are great for a variety of ages, though little kids may want you to read the writing. Quick and Easy Small World Play – grab a green rug or towel, some stones or wooden blocks, a couple of twigs or leaves from the garden, and some animal figurines, or dinosaurs, or fairies. Dump it all in the middle of the floor, or on the table, and let the kids do the rest. Dance – put on some groovy kid-friendly music and dance! This works great if you can dance along while cooking dinner or doing another task, and it can lift your mood too. If you are not up for dancing yourself, these Mini Groov3 dance workouts are great, this ‘Freeze Dance‘ video is also good. You can fond more great Youtube dance and movement channels for kids here, or search ‘just dance kids’ on YouTube and you’ll find lots of great dance videos – this Gummy Bear one is a fav. Audiobooks and podcasts – Audiobooks and story podcasts are great when you just can’t face reading another story, and there are loads of other great kids podcasts that will keep the kids interested. Libraries often have audiobook borrowing services, or check out our list of great free kids audiobooks, or our lists of great kids podcasts. Building Challenge – dump out a construction set (try combining two different sets like wooden blocks and magnet blocks or Lego) and use our printable building challenge cards to keep the kids busy creating. You can lie on the couch and shout out a challenge from one of the cards, set your phone timer for 10 minutes, and snooze till they are done! Go Outside – If the weather is good and you can muster up the energy to find shoes and hats, once you get outside you can lay on a rug on the grass and watch the kids play. Bring out some spoons and plastic bowls if you have a sandpit, or offer a few buckets or containers with a little bit of water in them. 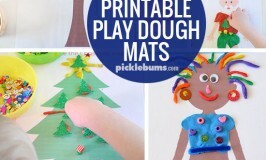 Even play dough can be easy outside, because you don’t have to worry about sweeping up the mess! Individual, Challenging, Fiddly Toys – you know, those toys that have little fiddly bits, that require a fair bit of concentration. I know it sounds counter intuitive to get out something with little pieces when you are feeling less than enthusiastic, but I’ve found these kind of individual activities engage my kids, quietly, on their own, for quite a while. 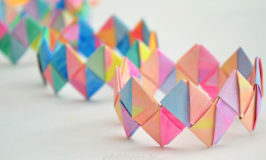 They are great for preschoolers, and work well if you need to take care of a younger sibling. Make sure it is a challenge for your child, but not too hard for them to do on their own, and that you have a complete set for each child. And hide these toys away for most of the time, only get them out when you need something special! What do you do when your kids want to play but you really don’t want to? I am having one of those days right now and the kids will not leave me alone. Thank you! This couldn’t have come at a better time. I am feeling lousy today and would like to be able to rest for a while without the children creating havoc around me. I’m going to grab the Ikea paper and crayons right now! Thank-you!!! This is great Kate. That rhymes and everything. thank you, i appreciate these ideas and opinions immensely! They’re great ideas – my fav is to go outdoor or dance – the smile on my little boys face is pure joy when I put our fav CD on. Must imprint in brain for my mummy fail days – love these ideas – thanks! One of my favorite games to play when I’m not feeling great is Doctor! I get to be the patient with all sorts of broken bones, fevers, chills etc…who has to lie very still on the couch and get better! I think they love the role reversal- they get to take care of mommy! I especially like the big roll of paper, would have never thought of that. I bet it would get my kids to take some and sit down to draw. Very cool! I have one child so I’m her full-time playmate. I often sit there and let her draw all over my back with texters! Keeps her busy for quite a while. Love your ideas. My preschooler (5years old ) is quite demanding but these are great ideas and will try this Wednesday!! Thank you!!! Also what is great for this age is the Lego classic as they have some easy manual to follow that they can do on their own. By the way love what you do!!! Yes! This new(ish) basic Lego sets are great for that age group aren’t they. Thanks so much for the suggestion. We really enjoyed dancing the gummy gummy gummy gummybear and building challenge. Thank you for sharing these wonderful ideas. Home » Easy Ways to Play with your Kids, Even When You Don’t Want To.